Archaeopteryx is the most famous transitional fossil, being both reptile and bird. 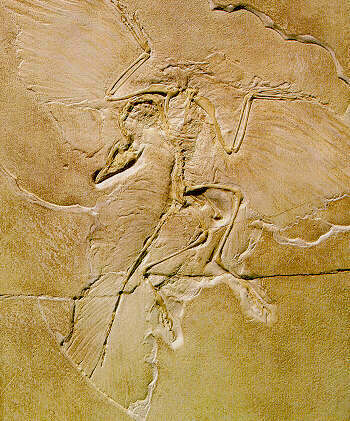 In the 1980's, some astronomers claimed that the Archaeopteryx fossils were frauds. The allegation was investigated and conclusively disproven. It has been claimed that the British Museum locked up its specimen and wouldn't let anyone look at it. That isn't true, and in fact the Museum added a display about the controversy, entitled "The Feathers Fly". Sir Fred Hoyle used to be a famous astronomer and science fiction writer. Lately, with the help of his associate Wickramasinghe, he has become an elderly dingbat, who reportedly thinks that insects are intelligent and are hiding it from us. There are six Archaeopteryx fossils, and the two best ones were both sold to museums in the late 1800's by the same family, the Haberleins. In 1985 Sir Fred published allegations that the feather impressions had been carved, by a Haberlein or by the British Museum. This was investigated, and there turn out to be a whole bunch of solid reasons to believe the fossils. For one, electron microscope pictures show fossilized bacteria attached to the feather area. No one in the nineteenth century could have detected these, much less faked them: they are pretty well impossible to fake today. For another, only two specimens passed through the Haberleins' hands, and only one went to the British Museum. Two other specimens show clear feather impressions. All of the fossils were found when flat pieces of rock were split in half lengthwise. So, each fossil has an upper half, and a lower half. The whole rockbed fractured long ago, and the hairline fissures filled with a white mineral. These fissures extend right through the fossil bones and through the feather area, and they match up perfectly on the two half-slabs. No forger could fake the match, and since some of the fissures only show up under ultraviolet light, no nineteenth century forger would have known they were there. In 1985 Hoyle said that the carving had been done to a compsognathus, but by 1988 he thought it was a flying reptile - a pterosaur. This doesn't explain the unchallenged Archaeopteryx fossils.